Royal Philips, a global leader in healthcare technology, has recently rolled out an awareness campaign aimed to empower mothers, expecting mothers, and their families in India. Launched under the Philips Avent brand, the campaign promotes the importance of breastfeeding, address societal barriers, while also introducing solutions to prolong breastfeeding as much as possible. As a part of the campaign, Philips Avent supports breast feeding for babies as long as possible, has rolled out a digital film that focuses on the bond between a mother and child and how mothers can empower themselves to ensure that their babies get the best nutrition in form of their mothers milk at this critical time in their life. It highlights how new mothers can strike a balance between their personal and commitments without comprising on the nutrition of their young ones through modern healthcare solutions for assisted breastfeeding. Dipanjan Chakraborty. Director Health & Wellness, Personal Health Philips India, added, “Nutrition, for a baby, is the highest priority and a mother’s milk provides the best nutrition for a child. At Philips Avent, we believe that a healthy start is a healthy future, and therefore leave no stone unturned to ensure that mothers and their families get the support they need to breastfeed their baby as long as possible. According to World Health Organisation, a child must be exclusively breastfed for 6 months, with continued breastfeeding supplemented by the desired complementary food for up to two years of age. This can also be extended further as per the discretion of the mother. 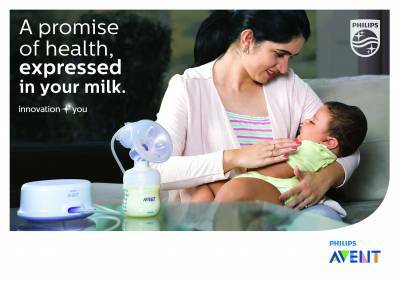 Philips Avent will be looking to initiate conversations on the importance of breastfeeding and the various solutions available to address societal barriers and to help prolong breastfeeding durations through the ongoing campaign. How Pulp Strategy turned an AIB post into a full-fledged marketing opportunity?